This refreshing salad was too good not to share. It was my little delicious dinner last night. I call it my ‘detox’ salad because a lot of the ingredients are actually quite detoxifying and super good for your body. There is little to no prep time to whip up this yummy meal. So start cooking – and your taste buds will thank you and your hips too! You will need (for the salad): 6 medium sized Brussels sprouts, 1 wedge iceberg lettuce, 10 almonds, ¼ cup cranberries, ¼ cup cooked quinoa, handful of fresh sprouts and 2 diced green onions. You will need (for salad dressing): ¼ cup olive oil, ¼ cup apple cider vinegar, 2 tbsp. lemon juice, 1 dash of garlic powder, 1 tsp. of mustard and a dash of salt and pepper. Simply cut off the end s of the Brussels sprouts (I just discarded the ends in the trash) and chop your tasty greens up nicely with a sharp knife, and place in a bowl. Chop your lettuce wedge up too and add it to your sprout mixture. Dice your almonds in a food processor (or simply by hand) and add to your bowl. 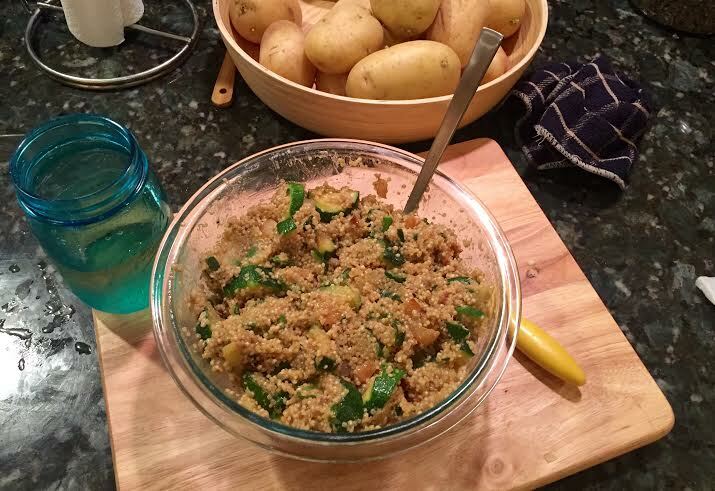 Then one by one layer on your other yummy ingredients: cooked quinoa, sprouts, cranberries and green onions. In a separate bowl, mix up your salad dressing components and once they are all mixed up – drizzle it over your awaiting salad. And then – enjoy. 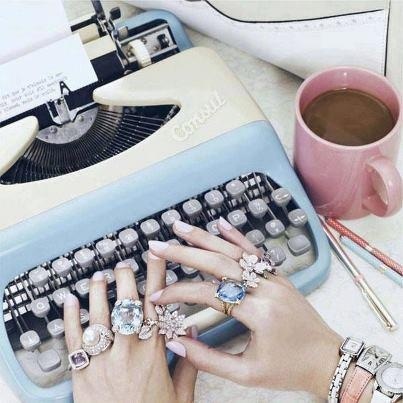 Today I hope you feel blessed, just really thankful –all the way from the crown of your head to your wiggling toes! 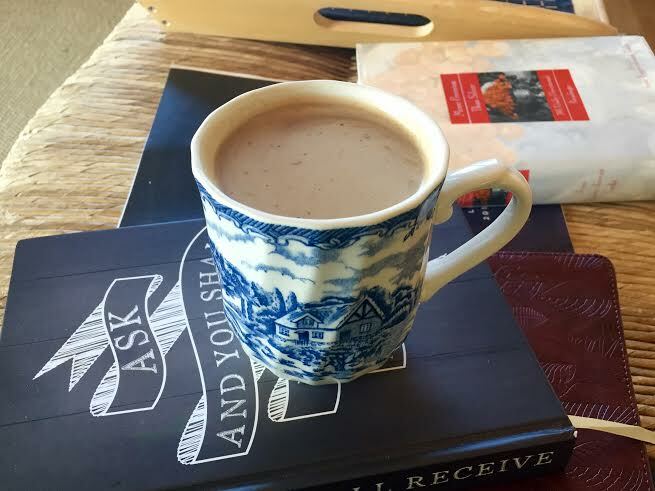 May you feel God’s bountiful promises that are new every single morning wash over your face and countenance. It’s inevitable; the world will burden you down with weighty problems and troubling information. You will see evil claim happiness and joy from those you love. You will experience the grip of darkness from time to time. But, do not lose heart; and do not for a second give into the darkness. Claim the blood of your Maker. His life, here on earth, was not sacrificed in vain. For he purchased my soul and yours with his crimson bloodshed. He makes the sun shine each morning and wraps you in the breeze of his never-ending comfort. The flowers open and bloom for our Sunrise Benefactor. The LORD is the gardener of our lives in this weed ridden land. 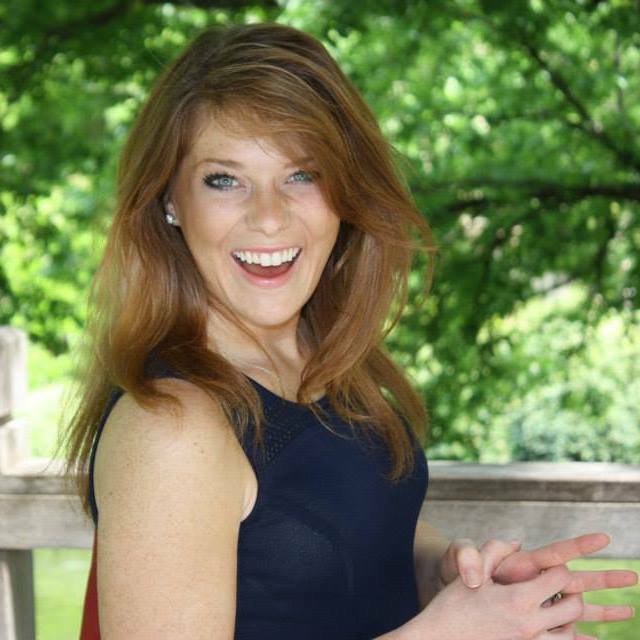 Look up – and smile, even in the face of haunting iniquity. Your God did the same – he overcame the grave and desires for you to mirror his glow to the world that has forgotten his love. Touch his nail scarred hands. Realize the gravity of that adoration for you – your soul. Squash fear and put on faith. Your armor is ready, all it takes is the willingness to strap it on. 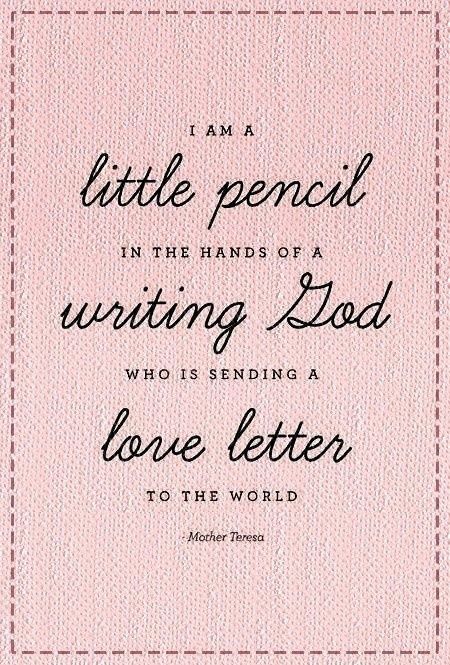 Dear One, remember in this world you will have trouble – but our God has overcome the world. It may be tough to feel the overpowering strength of your Creator in this venture in your life. However, he is there – holding on to you, breathing in your lungs and providing precious sight to your weary eyes. Through a cracked door – a light stream will illuminate an unrecognizable room. May we always seek his light and may our souls well up in thanksgiving for we are light cages on a parched and obscure earth. If you are like me, you are not a huge fan of cereal. First of all, being gluten free, I cannot eat a lot of different kinds. Shout out to Chex here – for creating so many flavors of cereal for wheat allergy people like me. 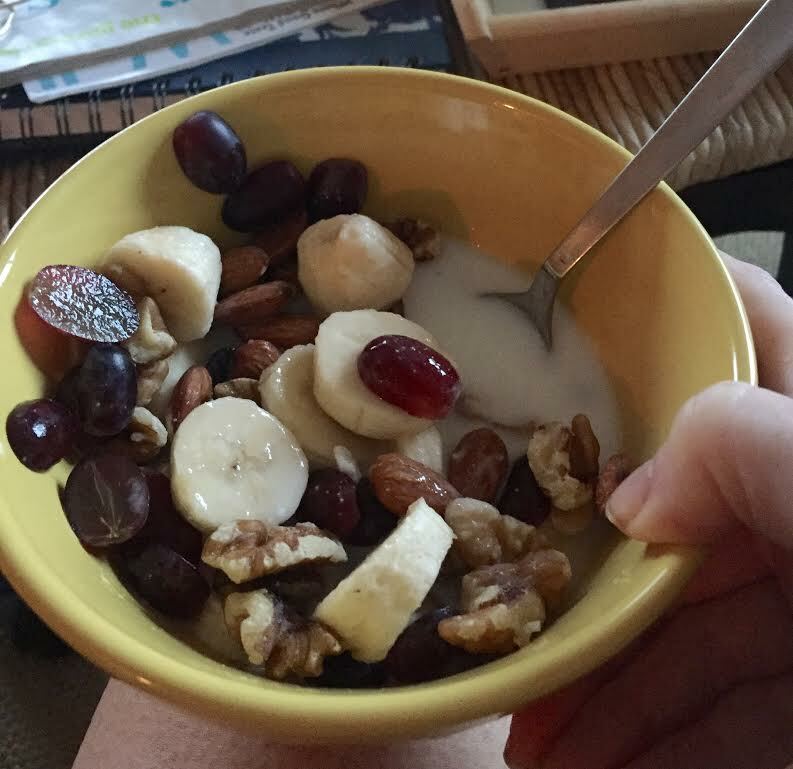 Anyway, you will absolutely love this fruit and nut cereal. 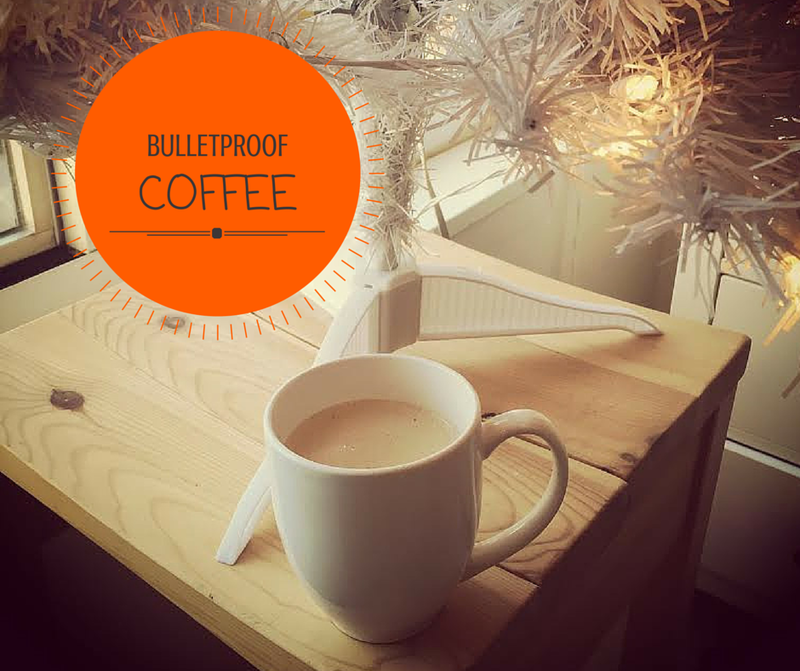 Not only is it gluten free, it can be paleo and dairy free by using almond milk or coconut milk. Yum. You will need: 1 banana (chopped), 12 grapes (halved), 1 handful of almonds, 1 handful of walnuts and 1 cup – or ½ cup of coconut milk. Also – feel free to try out different fruits like: blueberries, strawberries, pineapple. There are endless combination that could be yummy. I just used the fruits that were in my fridge. This is absolutely an amazing bowl of goodness to start your day off with. It’s crunchy, sweet, creamy and satisfying. Not to mention, it does not have all the gross preservatives, sugar and food coloring. This beautiful, creamy spread is perfect for quick chicken dinners. I love to spread this on my baked chicken – to create a little tasty zest. If you are a cheese lover, this is a perfect little topping for that lean and green dinner. It is so simple to make, and if you are not a fan of spreading it over your chicken, pair it with some pita chips and use it as a tasty snack dip. Yum. It is gluten free and creamy, delicious. You will need: 1 cup crumbled feta cheese, juice from 1 lemon, red crushed pepper, 2 tbsp. olive oil. Looking for an earthy dish to serve to family and friends? 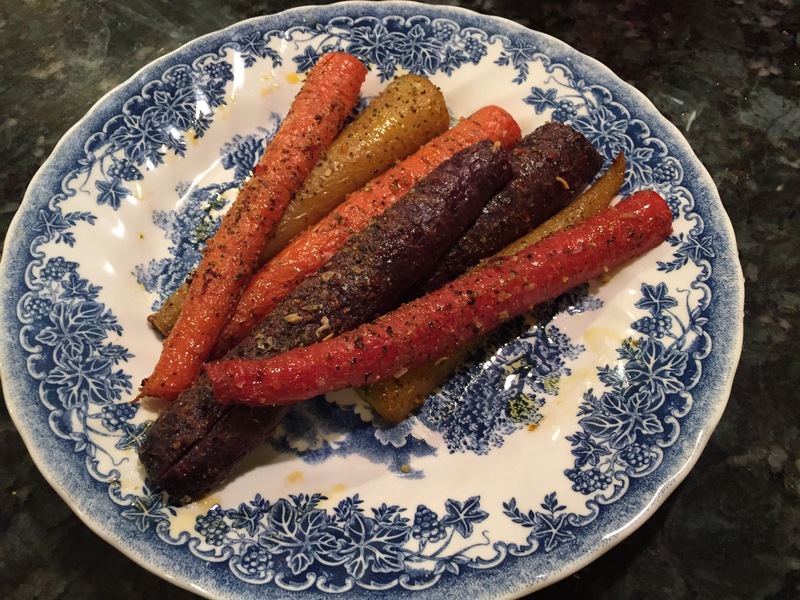 Well, look no further than this simple rainbow carrot recipe. It is very simple to make and absolutely delicious. Like melt in your mouth delicious. And it looks rather beautiful. 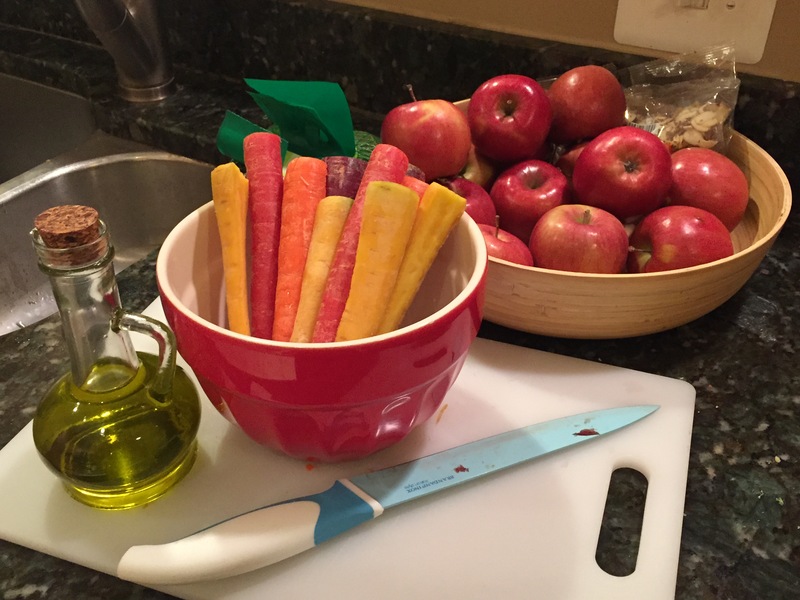 You will need: 1 bag of rainbow carrots (you can get these at Trader Joe’s), 2 tbsp. of olive oil and a heaping tbsp. of 21 Seasoning Salute (from Trader Joe’s as well). First cut your carrots long ways – you can see from the picture below, how I cut the carrots. You will need some elbow grease for this, but you can do it. Put your sweet little carrots in a bowl and soak them in some olive oil and sprinkle in your spices. Line a baking sheet with foil and preheat the oven to 350. 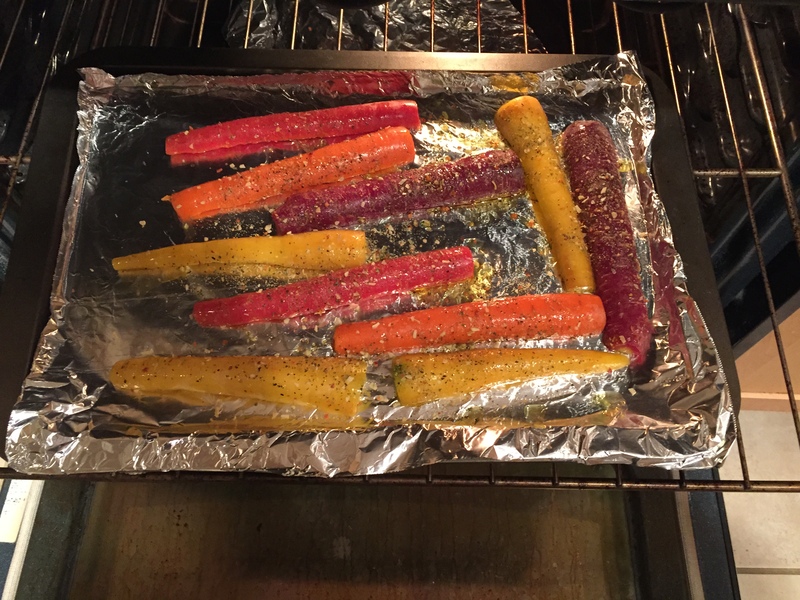 Dump your carrots on the baking sheet and shake more 21 Seasoning Salute on them. Pop them in the oven and bake for about 20 minutes. Yum – and serve at a dinner party or as a side at your dinner. Healthy and naturally gluten free. All I can say is – you’re welcome for this recipe. It is super fantastic and delicious. For those trying the paleo diet, this little snack fits the bill. You can serve these little pieces of goodness at a small party or bring them as your contribution to a gathering. Your taste buds will jump for joy with this little taste of savory goodness. For this recipe I used mini scallops; but, you can use the full sized ones if you wish! You will need: mini scallops, 1 tbsp. ghee, 1 tbsp. old bay seasoning, 1 package of bacon (real bacon) and some gluten free spaghetti noodles (or toothpicks). First of all, dump your scallops into a mixing bowl and coat them with that tablespoon of ghee and old bay seasoning. After they are coated set aside. 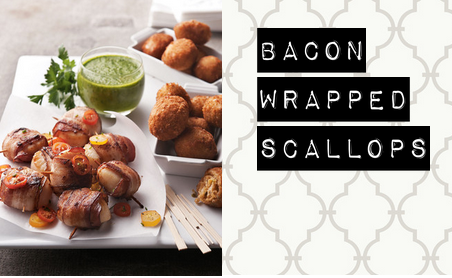 Pull out your bacon and slice each piece into 4 sections (for full sized scallops, just slice the bacon in halves). 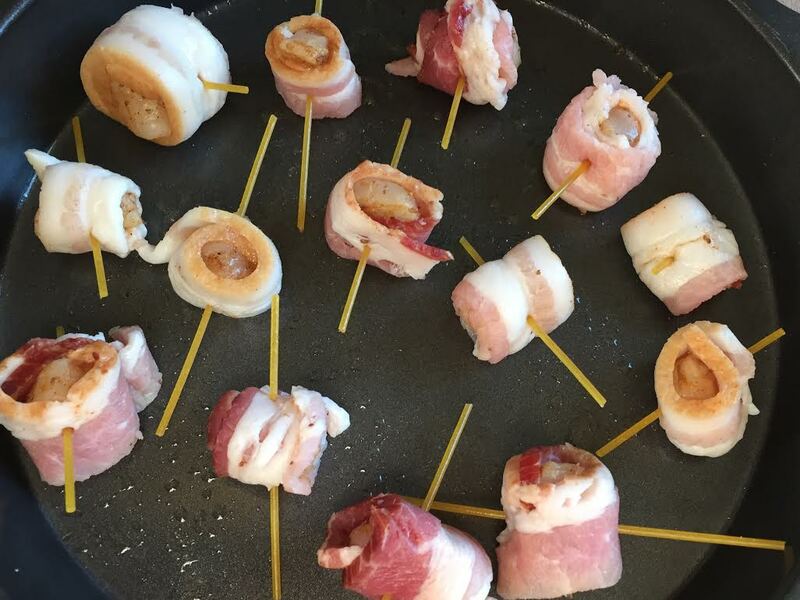 Simply take the mini bacon slice and roll it around your circle scallop and hold the two meats in place with a gluten free spaghetti noodle or toothpick. 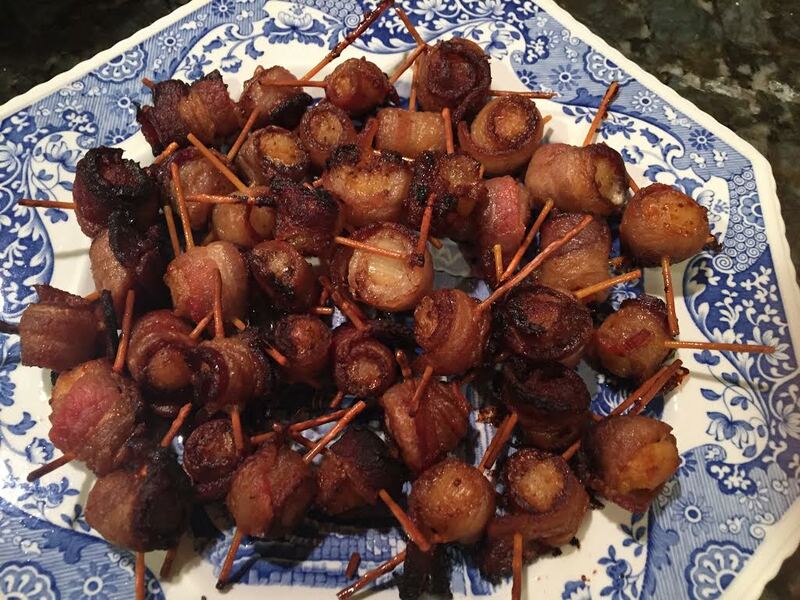 Continue to do this until all the scallops are rolled with a bacon slice. Pop in the oven for 20 minutes at 375. This will give the bacon more of a chance to cook and brown. Place your scallops pieces on a pretty plate and your are ready to serve. 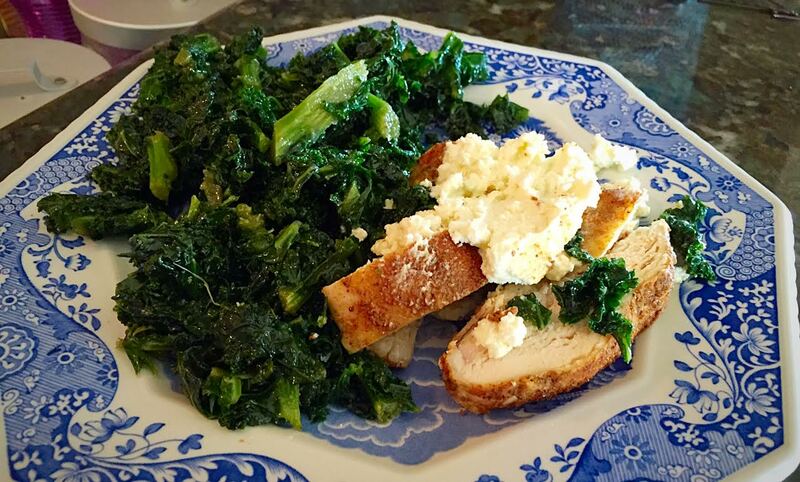 Want a great, fast savory dinner that is paleo and gluten free? And – I might add gives you Omega 3 vitamins as well! Well, make some time for salmon cakes tonight! You’ll love this little ball of goodness. And, since we are going to use a gluten free flour – these are 100% gluten free. Yay! Little carbs – and so tasty. 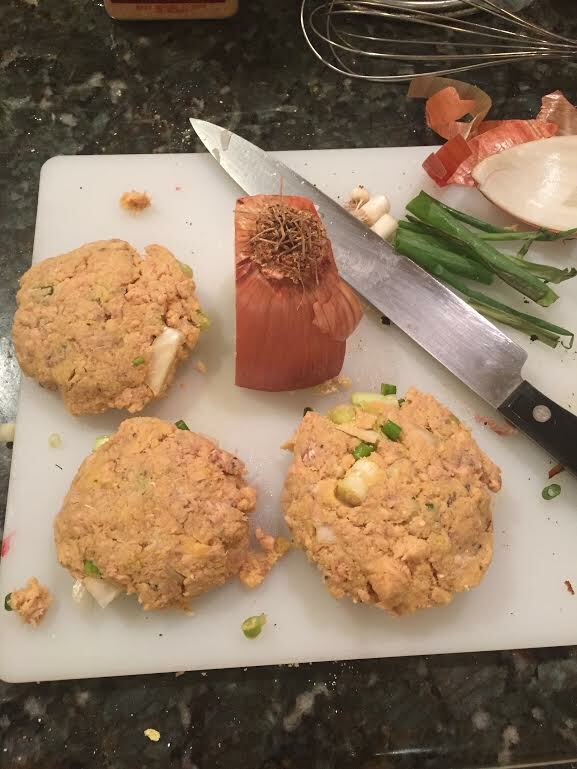 You will need: 1 can of wild salmon, 2 cage free eggs, 4 green onions, ¼ chopped yellow onion, 2 tbsp. gluten free mustard, 2 tbsp. coconut flour, salt and pepper to taste and coconut oil for the cooking pan! Simply open your can of salmon. If you have never used canned salmon before – there are bones and skin inside. Do not be alarmed. I use my fingers to pick out the little bones (however, if you want to keep them in there – they are edible.) I just choose to pick them out. Dump your salmon in a bowl and crack in your eggs. Chop your onions – both kinds – and add to your patty mixture. 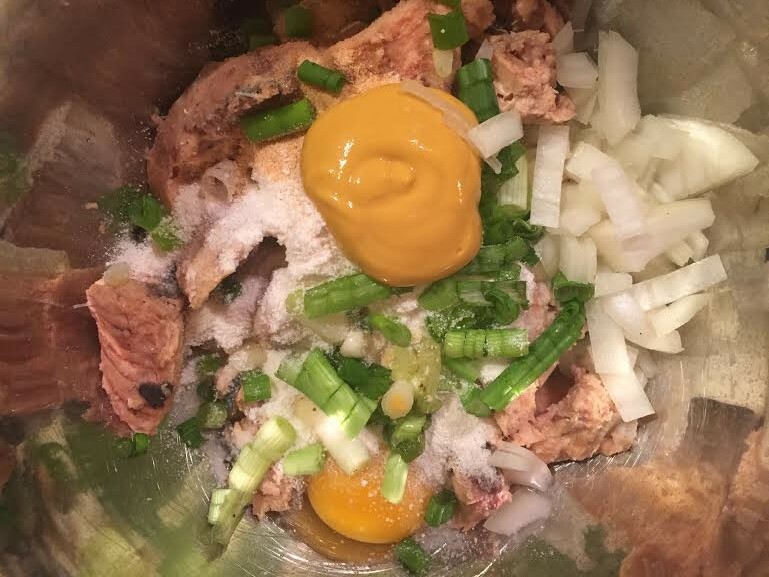 Add in the coconut flour and mustard. Sprinkle some salt and pepper into your mixture. Add garlic powder or onion powder, if you think you need that in there as well. May taste good. Form your meat mixture into little cakes (like below). And warm up your skillet – make sure you plop a dab of coconut oil in the pan. Place patties in the pan, once you see the coconut oil bubbling. 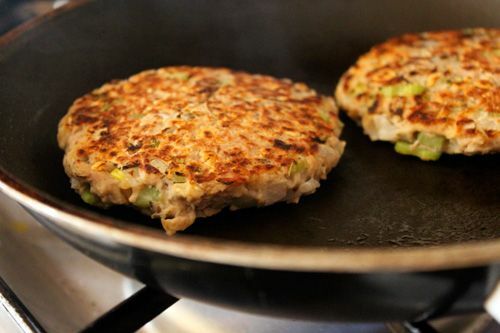 Let your salmon cakes cook on each side for about 3 minutes. Flip and cook on the other side. These cakes are going to be a little bit messier than ones that have plain flower (because we are using gluten free ingredients). But, they will look and taste fantastic. Eat plain or on top of a mixed green salad! Forgot to take a photo of my cakes. But, the finished product will look something like this. Yum!